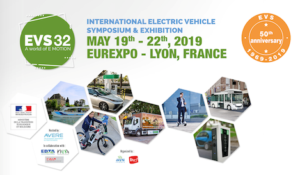 EVS32 will take place from 19 May to 22 May 2019 in Lyon, the capital of French gastronomy and a city that is highly involved in the development of electric mobility. The region is home to research centres, innovation clusters and manufacturers of electric vehicles, hydrogen fuel cells and driverless vehicles. The symposium will be held at the Eurexpo Congress Center situated east of Lyon, between the train station and the airport; an ideal location for driving test vehicles both in urban environments and on main roads and motorways. The exhibition, conference rooms and amphitheater are all located in Hall 6, adjacent to the car park from where test vehicles can be driven. The symposium will include various technical sessions and a number of events, including the welcome reception and Gala dinner, will be organised in prestigious Lyon venues. The EVS32 scientific program will include more than 150 lecture sessions spread across the three different days covering various complex topics presented by leading global e-mobility researchers. In addition to the lecture sessions, the posters area is here to allow scientists to present their papers through the dialogue sessions. The EVS32 will also host the AEC2019, which will include eight different sessions in total and it will provide delegates with a taste of how industry and policymakers are driving the global electromobility sector. The different high-level sessions cover all aspects of emobility. EVS32 will have three separate plenary sessions across three days with relevant and passionate speakers from around the world discussing their dedication to the transition to electrification. His Serene Highness Prince Albert II of Monaco. On May 19, from 06:00 pm to 08:00 pm, EVS32 has the pleasure to invite you to its welcome cocktail. Celebrate the 50th anniversary of EVS at the heart of the French capital of gastronomy. On May 21, EVS32 invites you to its gala evening, to be held from 8 :00 pm at the core of the exhibition hall 6. Discover the exquisite Lyonnaise cuisine while gathering with worldwide e-mobility actors. EMF is the biggest regional and Hungarian trade fair and professional conference of the electromobility sector to be held on September 18-19 in Budapest, Hungary! it is organised by the Hungarian Electromobility Association, is the most important regional professional event covering the global, regional and domestic trends of the electromobility and smart city sectors including topics of legislation, innovation and ongoing or upcoming trends, and cooperation on regional and European level. In addition to the decision-makers of the state and local government sector, the event will include domestic and international senior executives, opinion leaders and marketers. More information can be found here. The most important regional professional event about to cover the global, regional and domestic trends of the electromobility and smart city sectors including topics of legislation, innovation and ongoing or upcoming trends, and cooperation on regional and European level. In addition to the decision-makers of the state and local government sector, the event will include domestic and international senior executives, opinion leaders and marketers.The two-day conference will provide an opportunity to the attendees to get acquainted with the future of the market and to actively shape it at the same time, building domestic and international professional relationships and meet governmental and industrial stakeholders. About the program and contributors visit our webpage! EV2019 is an initiative for creating a sustainable future mobility in Eastern Europe, organized by Association for promoting electric vehicles in Romania (AVER), Icpe and Icpe Scientific Society and with technical co-sponsorship of IEEE Circuit and Systems Society (CAS) and IEEE Power and Energy Systems (PES). The conference will provide an excellent opportunity for all stakeholders from around the world to come together to discuss, deliberate and find suitable solutions for a sustainable E-Mobility. Moreover, the event will be a forum to exchange the latest research results, best practice guidelines or practical experience to find out the strategies in order to overcome the nowadays road blocks in creating a sustainable mobility and to exchange ideas and experience with other experts.